You've been sent into a hostile foreign country, on your own, to prevent a full-scale war from occurring. That's all that the storyline seems to say, and killing all the enemy soldiers single-handedly will be a tricky task indeed. 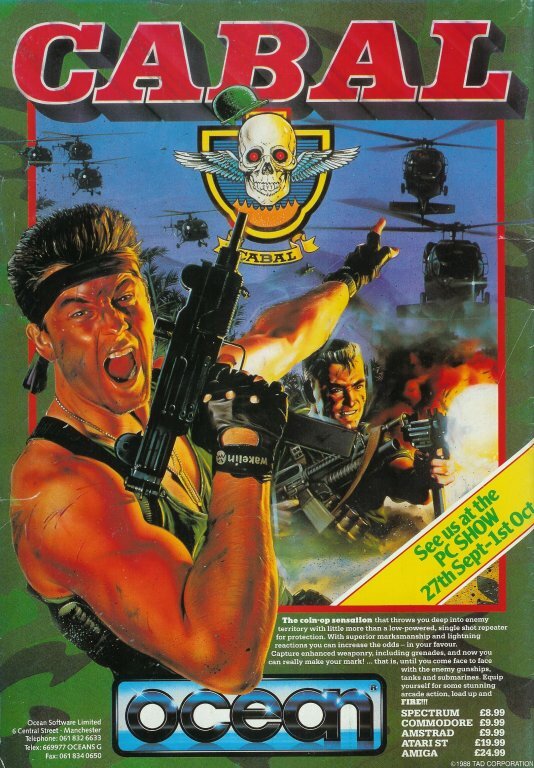 There are twenty screens to blast your way through, with hordes of soldiers to shoot, and tanks and buildings to blow up. Thankfully you have an unlimited supply of ammunition in your gun, although your supply of grenades is limited. Fortunately you can obtain more grenades as you play the game. 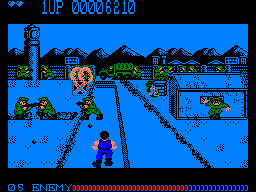 The graphics are slightly disappointing; the backgrounds are monochrome and the movement of the soldiers and your crosshairs is a bit jerky. 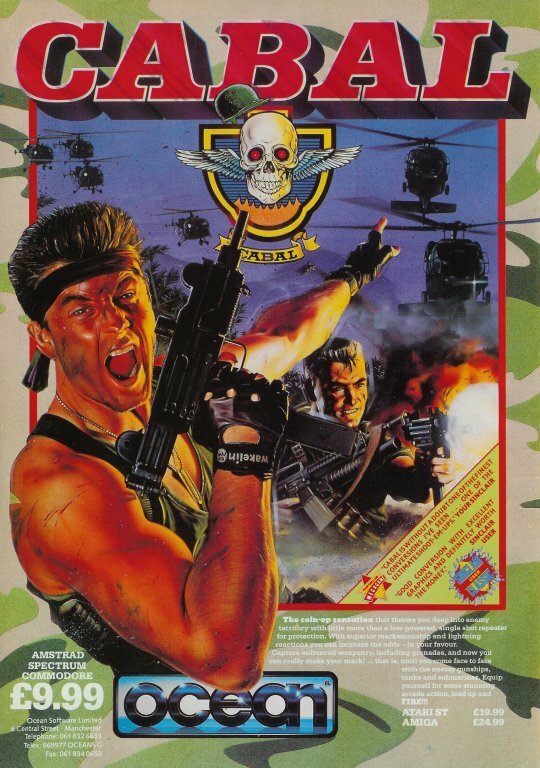 Despite this, and the high difficulty, it's a fairly decent shoot-'em-up. Take part in a contest of six events with up to three other players, or on your own. 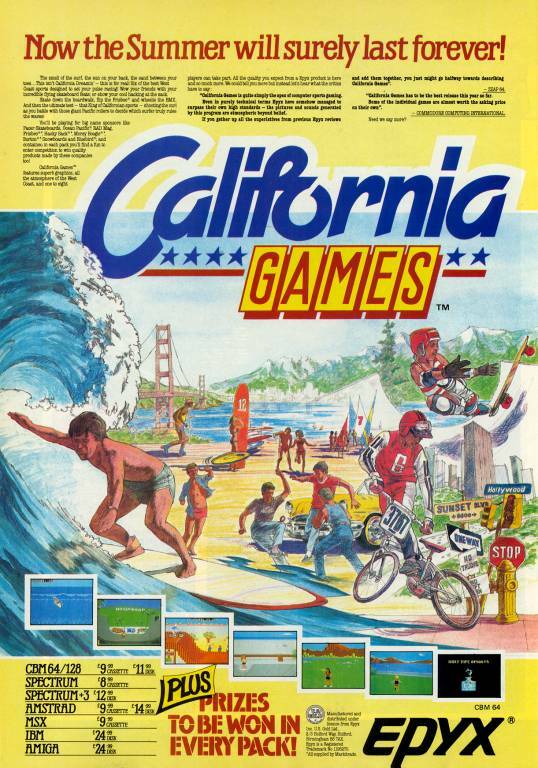 The events include the half pipe (skateboarding), skating, surfing, BMX biking, discus throwing, and the foot bag – don't ask. You also get to choose who you're sponsored by, although this doesn't affect the game in any way. 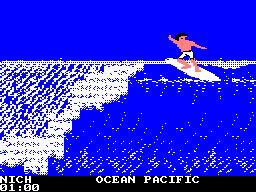 Apart from the surfing and the BMX biking, most of the events are either too boring or too tricky to master. The graphics aren't up to much, either, and sound effects are pretty sparse. Four strange objects from the 20th century have transported themselves to mediaeval times. The great knight Camelot must collect these objects, with mysterious names like The Unburning Fire (a lightbulb) and The Mirror of Wisdom (a television). Each object is collected one at a time and presented to a guardian. You must then find the portal that will take you to the next stage of your journey. This is a platform game involving a lot of swordplay to kill some monsters, and jumping and dodging to avoid smaller creatures. 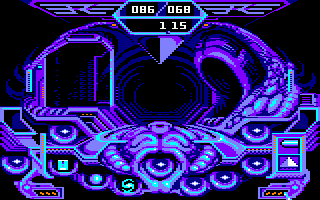 It's a typical Dinamic game, though; the graphics and music are both lovely, but the gameplay is far too difficult, requiring very precise timing. It's a highly frustrating game to play. Campeones is a 2D racing game set along several courses. Your little red racing car waits for the flag before setting off along the race track. Pressing left or right rotates your car while pressing up accelerates it. Along the way, four other competitors need to be beaten in order to qualify for the next race. The controls work fine with some careful planning required to avoid crashing. 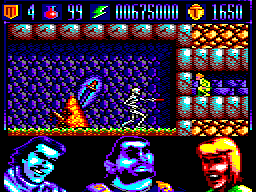 It's a colourful jaunt with basic graphics and some chittery engine noises. Bob Marley fans everywhere will smile as they listen to the game music. One last thing – don't run over the flag man, as you will be disqualified! Capitán Trueno (Captain Thunder) was a very famous comic in Spain, which was first published in 1956. The game is divided into two parts. The first part is an adventure in which you can switch between three different characters. The second part is a side-scrolling arcade game which reminds me of one of Dinamic's other games, Risky Woods, a bit (but that game wasn't released on the CPC). 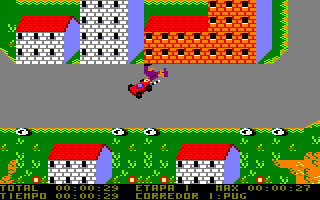 Capitán Trueno was one of the last classic games by Dinamic and has all the features that could be expected – good graphics, great gameplay and, at least this time, a reasonable difficulty level. Watch YouTube videos of this game by: jgonza (part 1), jgonza (part 2), Metr81 (part 1), Metr81 (part 2), Retro Danuart. Dr. Megalomann is threatening to launch a missile that will destroy America, unless the President resigns and hands over power to him. Captain America is called upon to enter the Doom Tube – a multi-level bunker contaminated with a deadly toxin which increases in severity as you go further down the shaft. You have to collect passwords and get the ingredients to an anti-toxin in order to progress. The game has some nice, colourful graphics, a nice tune and sound effects, but the gameplay can be quite frustrating. You only get six shields, and if one goes off the screen, you lose it, and you could find yourself with no shields, leaving you defenceless. Coming across the robot enemies will drain your immunity pretty quickly, especially if you get stuck when you touch one of them. Controlling your shield is also quite frustrating. Quirky French science fiction adventure in which you are a dying alien who has to travel the universe in order to find a cure for your ailment. Using your highly advanced starship, you must land on various planets engaging in conversation with a wide variety of alien species who can hopefully help you on your quest before your time runs out. It looks stunning as the graphics are actually quite impressive. The interface, via an animated alien hand, is also a nice feature. 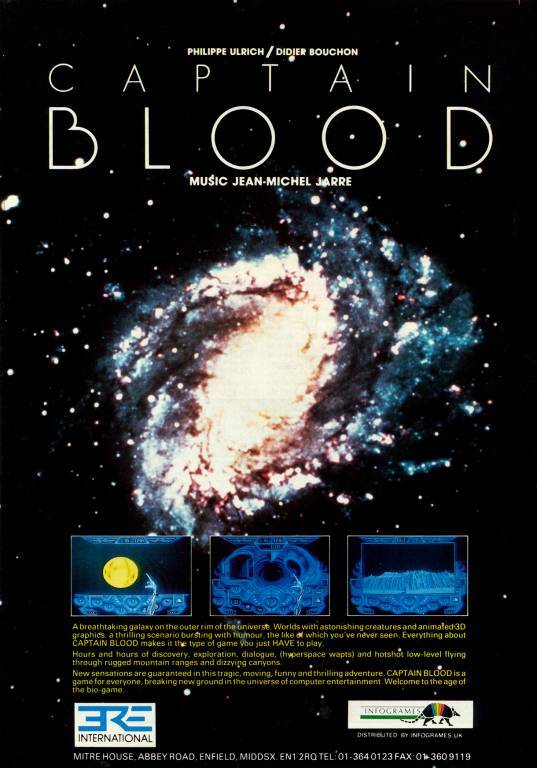 The music, incidentally, is provided by electronic guru Jean-Michel Jarre. However, all this fails to detract from what isn't a particularly engaging game. The evil (and completely mad) scientist Austen von Flyswatter has stolen the world's largest collection of diamonds, and has stored them on a rocket which he intends to fly to the moon. This looks like a job for Captain Dynamo, who has come out of retirement to collect all the diamonds. 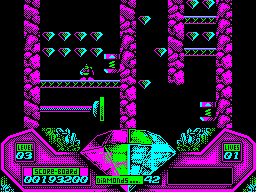 This is a platform game with seven levels, each of which is filled with diamonds as well as lots of hazards. Each level also contains a secret room with even more diamonds to collect. Fortunately, you don't have to collect all of the diamonds to complete the level. 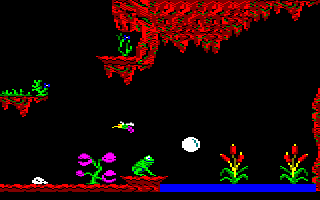 The graphics are detailed, although some garish colour schemes are used. On the other hand, the sound effects are fairly rudimentary. While the game itself is nothing original, it's fairly enjoyable to play. Help Captain Kidd collect his treasure on each screen, but make sure you collect bombs as well before they explode. When you collect treasure, you can't move back on to the square it was contained within, so some thinking is required, otherwise you may well encounter a bomb which you can't reach. You must also avoid the boots and the skulls. This is an old game with poor graphics and a short tune which plays continuously and becomes very annoying. All the levels are essentially the same and there's no variety whatsoever. The eco-warrior with the blue skin and green hair is out to protect the Earth from the scum that are polluting it. 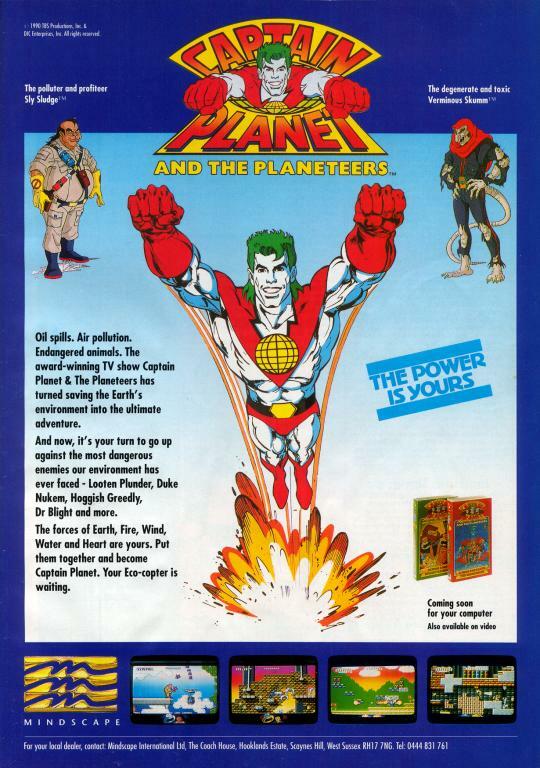 Three men – Sly Sludge, Looten Plunder, and Dr. Blight – are carrying out their nefarious tactics, and it's Captain Planet's duty to save the day, and the Earth. 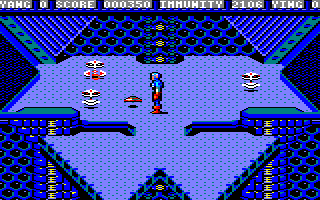 In each of the three levels, you must make your way through the onslaught of flying creatures and rockets and reach the end-of-level guardian. Easy? No way; the flying creatures are very difficult to avoid, and they explode with a shower of hearts which makes it tricky to see where other creatures are. If I think this game is too difficult, then I can imagine what younger players would think of it.